The obvious reply to that would have been "Comrade, when it comes to drunken troops and nuclear buttons, it's not the Americans I'm worried about". Of course after Helmut Schmidt, the SPD was pretty much on the anti-Doubletrack-train already anyway. What Vogel would have done in the (unlikely) case he became chancellor in the 1983 snap election provoked by Helmut Kohl in light of favorable poll numbers after the Liberals switched allegiance to CDU/CSU the previous year remains conjecture; actual national responsibilities in office tend to refocus the mind. However, as opposition leader his chief aim was reuniting the SPD after the controversy over the basing of Pershing II, and the party's special convention in November that year pretty unanimously decided to be against, voting thusly in parliament three days later. So Andropov was probably preaching to the choir two months ahead of the election anyway. Im actually reading a good book about Zuyev, the defector that brought the Mig29 across, and he raised some interesting points about drunkenness. He said that although they did have some amusing drinking games (including one where they all shout polar bear and all had to jump under the table...), he said in his opinion they drank much less than the British and the Americans. He was horrified at stories he heard from the Vietnam war about American pilots getting drunk up to 12 hours before a flight. And he was astounded to hear about British pilots getting drunk every night (as you can see in that Vulcan Video I posted). Apparently the VVS wouldnt allow drinking for 36 hours before a flight. Though he admitted one pilot that wrapped himself around the runway (an ex PVO pilot) was drunk. But it wasnt common according to him. On the other hand, the VVS wasnt the Soviet Army, which certainly DID have a major problem. Thats interesting on the West German perspective. At the time it was passed over here in the media, we were largely British centric over the GLCM deployment, so our Media doesnt change very much. Let's not overlook that Andropov wasn't a chekist but a diplomat so he knew full well how the world game was played. He did, but he was ill. We really dont know what they were filling his system with to keep him alive. I can remember Anthony Eden was reportedly on several medications to alievate a bowel problem, and that seems to have had some serious impact on his decision making ability at the time of Suez. Still, Andropov didnt launch. So he wasnt THAT ill. But the dangers here are self evident. Some useful new sources there. I'm not sure I agree with all the conclusions the NSArchive comes to, however. One of the problems with the conclusion the NSA reach, is that their own evidence shows that RYAN was ordered well before the "destabilising" NATO missile deployments they seek to blame for the War Scare. In fact, Andropov seems to have gone off the deep end on the basis of very little in 1981. You'd have to wonder whether, in fact, a more likely driver was him seeking to solidify his internal powerbase by drumming up a "besieged fortress" mentality. If you're head of the KGB and angling to be head of the CPSU then a massive project that only the KGB can lead to protect the USSR seems like a very astute political move. Some of the other evidence cited, such as "Soviet fears of encirclement" could have been written at any time in the past century. It is hardly compelling or diagnostic. Nor is the Andropov - Vogel conversation, which is clearly an effort by Andropov to seed various thoughts in the mind of a Western politician, and not just anyone, someone who might have become Chancellor of West Germany in March 1983. The evidence of Ustinov complaining publicly about NATO military exercises again could come from a Russian defence minister at any time in the last century. In fact, just this week we have heard almost identical tone from the Russian Defence Ministry re NATO exercises. There is nothing in the words of Ustinov quoted to indicate any particularly dramatic change at that moment. The "world on the brink of war" thesis still requires some compelling evidence to support the claims made. I think we forget, quite how disturbing Reagan was in 1981. He was preaching about the death of the Communism, rollback everywhere he could engineer it. Now admittedly these were some sensative guys, but if you bear in mind how Trump sounds to us sometimes, (alright, all the time) its not hard to imagine how scared shitless they probably were. Everyone was. You only have to listen to some of the music at the time to have some idea how Reagan was viewed, not just in the Soviet Union, but everywhere. In fairness he was far more intelligent and cautious than we believed. But his rhetoric wasnt. He just hadnt learned yet to stop talking on the inernational stage as if he was talking to the American heartland. So rather than view the start of the crisis as being less GLCM and Pershing 2 deployment, and more Reagan being elected, it does kind of make sense. Certainly not 'case proven' though Ill be the first to admit admit. I really want to see what the reports were about Soviet warplanes bombed up with tactical nuclear weapons were in East Germany. Ive not seen anything about it in the USMLM reports, I idly wonder if the Brixmis reports would have anything about it. A tank and an armored personnel carrier, just two of the 3,500 vehicles used in Autumn Forge, rumble through a small village. From Air Man. The APC that shall not be named! This was interesting too. Personally I would have paid good money to see a fallout shelter for cows. Edited by Stuart Galbraith, 09 November 2018 - 0917 AM. I wouldn't want to spend too much time inside a falloutshelter with a cow. Washington, D.C., February 28, 2019 – The National Security Archive today filed a FOIA lawsuit to compel the Defense Intelligence Agency to release documents likely containing a letter from former DIA director Leonard Perroots, warning of the danger caused by the 1983 NATO nuclear exercise Able Archer 83. The Archive filed suit after receiving no substantive response to the FOIA request six months since filing the request and being told our “unusual” request is 1,133rd within the DIA’s glacial and growing queue. After Perroots observed the signs of elevated Soviet military alert, he chose not to respond in kind, thus averting further escalation during this “War Scare.” According to the PFIAB report, Perroots and other officers in charge of the Able Archer 83 exercise deescalated the risk “by doing nothing in the face of evidence that parts of the Soviet armed forces were moving to an unusual level of alert.” The report credits his decision to act “correctly out of instinct, not informed guidance” for ending the nuclear tension. The Defense Intelligence Agency has long failed to live up to its Freedom of Information Act requirements. According to the most recent federal reporting, the DIA’s oldest pending FOIA request is over fourteen years old and the average “complex” FOIA request has been pending at DIA for 656 days. (The DIA deems 97.8 percent of all FOIAs as “complex.”) When FOIAs are finally processed by DIA, they are usually over-redacted. These redactions include the relatively recent use of statutory exemption 10 USC 424 markings to censor material which was previously available to the public. Unless the DIA revamps and improves its FOIA processes, requesters will increasingly turn to the courts to force the agency to comply with the law. 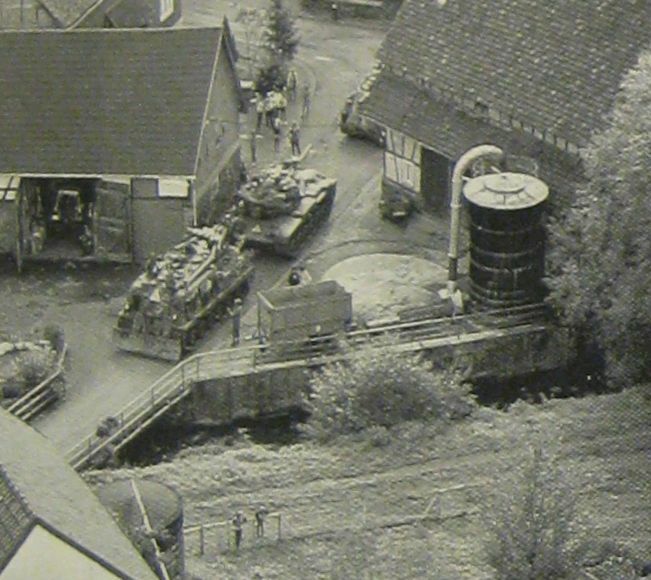 That is an M-88 Recovery vehicle towing the tank.